I scream for ICE CREAM! ðŸ¦ Specially, if it's covered in chocolate, pretzels, peanut butter AND it's HEALTHY!!! #winning! #Recipe for 2! . 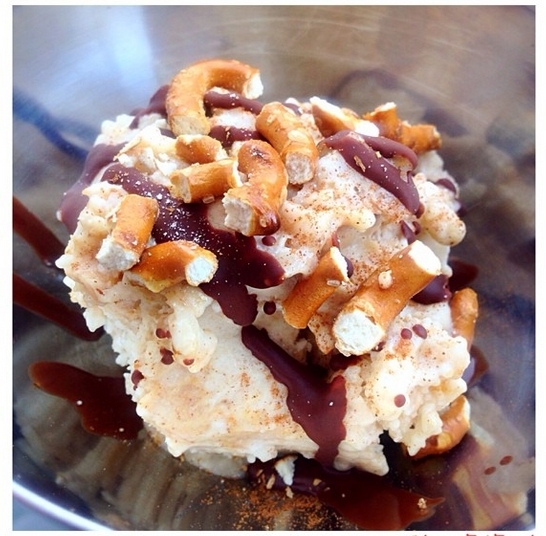 3 frozen bananas 2 heaping tbsp peanut butter 1 tsp vanilla Dash of cinnamon . 2 tbsp dark chocolate chips 1/2 tbsp coconut oil, 6 pretzels, crushed . In a blender, pulse the bananas, PB, vanilla and cinnamon until it is smooth and creamy. Spoon it out into a container and stick it in your freezer for a 1/2 hour - 1 hour. Scoop out your ice cream into 2 bowls. Microwave the chocolate chips and the coconut oil; mix. Drizzle your ice cream with chocolate and top with crushed pretzels!